It was with profound sadness that I received the news of Wolfgang's passing.He was a designer / plantsman in the truest sense - a leader never a follower, and an inspirational friend to many. Your landscapes and writings will continue as your legacy, personal memories of your friendship will always be treasured. An icon designer who influences everywhere and is enjoyed by all. We will miss you. Mein Vater, Reinhold, und Wolfgang waren Sudienkollegen in Berlin und schテ、tzten sich sehr. Sie hielten テシber viele Jahrzehnte den Kontakt und nahmen Anteil an der gegenseitigen fachlichen und persテカnlichen Entwicklung. Wir nehmen Abschied von einem herausragenden Fachmann, der weit テシber die Grenzen seines Landes bekannt und geschテ、tzt war, von einem warmherzigen Menschenfreund, der es sich zum Ziel gemacht hat, die Vielfalt der Flora den Menschen vorzustellen und erlebbar werden zu lassen. Wir wテシnschen Dir Roland, daテ・Du die Trauer in dem Wissen bewテ、ltigst, daテ・Dein Vater ein erfテシlltes Leben hatte und sein Andenken durch Dein weiteres Wirken in besonderer Weise fortbesteht. Wir sind in diesen Tagen mit Euch eng verbunden. Herzliche Anteilnahme aus Berlin! Dec18/2011 With deep consternation I have received the sad news from Wolfgang `s death. I am very sad. It is a great loss also for me. Wolfgang was an outstanding expert in landscape architecture and a very warm-hearted person.He has been well-known for kindness, generosity, and intense devotion to his work. These qualities, and others, earned him the respect of us all. His death leaves a gap also in my life. I am very sure that many people around the world will like to remember Wolfgang in future, too. It is with great sympathy that I express my deepest condolences to Wolfang `family and to Carol. My heart and my thoughts are with you in these difficult times. Dec18/2011 We have lost a giant in the industry. Wolfie, you will be missed. Dec18/2011 I am a landscape architect and the style of design that Wolfgang developed with the use of sweeps of ornamental grasses and perennials has truly been inspirational in my career. I will miss his work but this legacy lives on. Dec18/2011 What an incredible man. I have learned so much from you, and have so many great memories of all the gardens that we installed. Learning from you was very easy, you were a great teacher, very patient and willing to explain things more then once. I will never forget our times at Americana Manhasset, as a big part of you will live on there eternally. Thank you for letting me see plants in a different light. God Bless. Dec18/2011 I never met you personally, Wolfgang, but I have admired your beautiful landscaping for years and years, and have always heard about you from friends in the landscaping business. You left our part of the world a more beautiful place. Thank you! Dec18/2011 I will surely miss Wolfgang. His passion and enthusiasm for plants and the environment was completely infectious. He turned my boring suburban lawn into a lush oasis that changes with every passing season and has become a refuge for all it's inhabitants, be it human, insect, reptilian, bird or animal. He was a walking encyclopedia of plants. If Wolfgang recommended a plant, you could bank on it being successful. He composed his landscapes in a very painterly fashion using broad brush strokes. He opened my eyes to planting in great masses. Wolfgang lives on in his gardens and in our hearts. For all those who knew him let's take a queue from him and remember to be passionate in whatever we do, be unselfish with our time and talents, and never stop marveling at the world around us. Thank you Wolfgang. Dec17/2011 He introduced myself and my collegues to big fun plants! I remember on a field trip to one of his gardens he patiently repeated to me three times..Inn...u...la! Thank you for your knowledge, passion, and your free spirit. Dec17/2011 Dear Mr. Wolfgang,Just getting out of school with my bachelors of Environmental Design and not finding work I became disillusioned with the prospect of becoming a landscape architect. In the recent months your practice, among others, has rekindled my love for the profession and for that I thank you. Ideas carry on. Dec17/2011 A man that has marked the landscape in such a very positive way. So sorry to hear of the passing of Wolfgang... I had the pleasure of meeting him when he visited Huntington Beach a few years back. I was quite taken by his gentle demeanor and kind spirit. He was a very thoughtful and caring gentleman. And even though he is no longer with us physically, his spirit will live on in the legacy he leaves with respect to his chosen field of expertise. He will be missed and my prayers are with his family. Dec17/2011 It was a true pleasure to know Wolfgang, both as an unsurpassed plantsman, designer, and mentor, and a thoughtful friend with a sprightly sense of humor. His spirit has infused so many gardens and landscapes all over the world, and will continue to bring to all of us his wonderful, unique vision of beauty melded with practicality. He was one of the rare individuals who truly made the world a better place. He will be sadly missed but long remembered. We are in Chestertown this morning, and as I look outside, and the early light begins to touch the landscape, I think of Wolfgang and the lasting joy and discovery that he has left behind with so many people. His spirit is in my garden, and as I look around, I see him walking about, pulling up a weed, suggesting an improvement, correcting my pronunciations, and occasionally, at my request, shaping an awkward shrub. More than most, he has left a legacy in the earth. Part of him will be with me here in the garden as long as I can see it. I am grieved to hear that your father passed away. Your father was kind to me, and I will always grateful for that. It must be very distressing time for you and and your family. Let me know if I can support you in some way. Please accept my deepest sympathy. It was so very sad to hear about Wolfgang's passing, and to think that I won't see him in person again as I had over the last twenty odd years in the U.S and in Germany. Yet I am consoled by and have to smile remembering him, his liveliness, vigor and sense of humor. He's gone but has lived life well and has shared it with so many of us who will always remember him fondly. His legacy lives on in the many gardens he has so masterfully designed and within the people he has inspired both professionally and personally. Wolfgang, you'll be missed! Visiting Germany won't be the same again without your company. Thank you for all the times I shared with you, Roland and Omi at your home in Townsend, and on a number of trips in various parts of Germany. I窶冤l treasure the memories for the remainder of my life. Unforgotten ouer garden tours, unparalelled ouer meetings. Iツエam glad, get to know you personally. A great enrichmant for me. Thanks a lot ! Peace and love ! You were not born in America, but you defined what it means to garden in America. Thank you for what you have done and for what others will do because of you. Dear Wolfgang... I still have Fallopia 'Crimson Beauty' you dug out for me - the only plant I took with me when moving - . Yes, you went to the Courthouse garden and dug it out yourself. You did not know how much it meant to me. You cared about people, without thinking if you will ever meet them again, if they are "useful" or not. I wonder if you knew how many people you have influenced. I had the utmost respect for you - not only as a landscape architect, but as a person. Roland, my heartfelt condolences at the passing of your father. I was honored to have had him autograph a copy of his book for me. The environments he created were truly spectacular. I am deeply saddened by the news. When someone has been an inspiration longer that you can remember, it tough to find the words. I owe much of my design style Wolfgang, thank you to being the ultimate designer/plantsmen. I will forever see wolfgang out planting and taking care of the various gardens around Towson, OH and ofcourse ( always introdusing new plants for all the people to share) What a GREAT MAN and true inspiration, I will miss you, THANK YOU ! 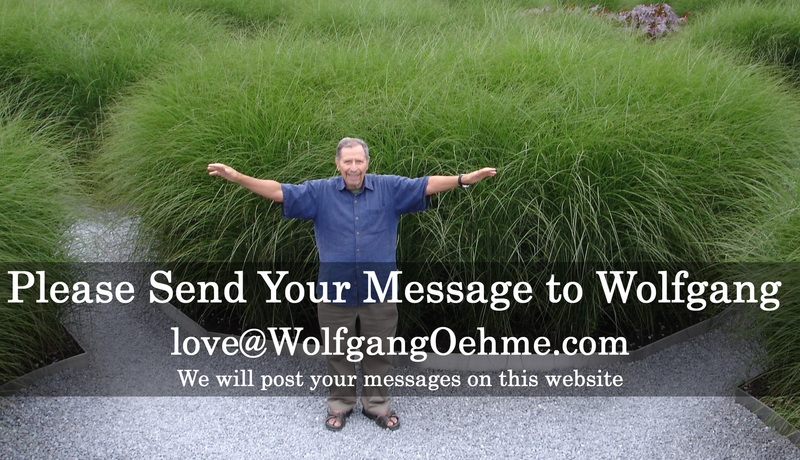 Dec16/2011 Wolfgang Oehme lived and loved well. He always had this youthful exuberance for life and wanted to share his vast knowledge. His happiest times were spent pulling edible weeds, which was to be his meal. Who could contain his/her merriment at this display of pure bliss? Many cheers for Wolfgang. Enviroscapes will forever be grateful for your insight and passion for the landscape industry. You were a true mentor to my husband, Todd Pugh. I, Anna, still remember coming home years ago(Ohio) to find you sleeping on our couch. We had a humble home with a celebrity in our living room! You kept it real. Thank you Wolfgang for the great gifts your have brought to us. Your influence and insights will serve as constant reminders of your tremendous talents. What great sorrow at his passing. What great thanks for all he has given. So sorry to hear of Wolfgang's passing. I had the pleasure of living in Towson for 20+ years, and driving through the area saw many gardens designed or influenced by Wolfgang. What a treat! You where an inspiration! I am glad I met you at NYU last winter at the Van Sweeden seminar. All my best to the family. I was a novice landscape gardening student in 1979 when Wolfgang took his time to show me and another friend some of his gardens and share some of his wisdom. I have wonderful pictures of that trip and always cherished how such a famous man was willing to share. He will be missed. He was a true inspiration. So sorry to hear of Wolfgang's passing.....he was a brilliant man that will be missed by all those who knew him.